The V19 is a top-of-the-range C-frame machine especially characterized by its very low space requirement. Because the "C-Frame” structure allows operator access on three sides, it is essential for all profile welding or extruded hoses applications. Closure via the top, so that the lower mold is fixed and can support the displacement profiles. 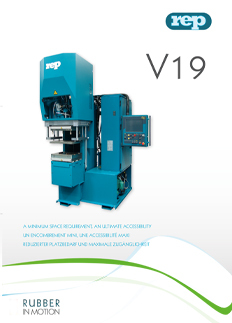 The V19 exists in 2 versions: It may be equipped with a P01 injection unit for plastic injection (TPV) or with a Y01 injection unit for rubber molding (traditional elastomers).